The good news is that Hurricane Irma has been downgraded from the most damaging Category 5. The bad news is that more recent refinement in the forecast models now put the still-dangerous Category 3 storm on a collision course with Florida’s $8 billion agricultural economy. According to the U.S. Department of Agriculture, there are more than 47,000 commercial farms in Florida, and last year it was the United States’ top producer of not only oranges and sugar cane, but also a host of other fruits and vegetables including grapefruit, watermelons, tomatoes, and cucumbers. It contributes more than half the country’s orange and grapefruit crops, on-tree fruit sales of which totaled more than $825 million for the 2015-2016 growing season. The agricultural futures market showed signs of anxiety this week in advance of Irma’s arrival to the U.S. mainland. “They’re putting price premiums into anything that’s in the state of Florida,” commodity trading consultant Mike Seery told NBC News. Oranges, sugar, even cattle futures have risen — in some cases, reversing sustained troughs — which speaks to market worries. Initial, somewhat diverging forecasts had one of two paths for Irma: One that hugged the state’s East Coast and a second that cut a swath roughly through the center of the state. “The worst scenario would be if the storm ends up a little bit west,” said MDA Weather Services senior agricultural meteorologist Kyle Tapley. An easterly track would have spared more citrus groves, vegetable farms and cattle operations while dealing out more damage to the sugar cane producers in the state’s southeastern region. But that doesn’t appear to be how Irma will play out: Meteorological consensus was coalescing around the forecast of a more western track, which would take the most damaging wind and rain up through Florida’s center, potentially affecting much more of its 9.4 million acres of farmland. “What I can say is that we currently expect nearly all of the citrus acreage in Florida to receive damaging winds,” Tapley said. Orange juice futures have risen more than 15 percent in recent days, said KKM Financial CEO Jeff Kilburg, indicating that the market is bracing for the worst. “The amount of loss in terms of economic dollars would be impossible to be as high as it was in 2004 and 2005, simply because the state doesn’t produce as much citrus as it did then,” said Judith Ganes-Chase, founder and president of J. Ganes Consulting. A string of hurricanes in those years wiped out some 40 percent of production, and the industry never fully recovered. The remaining trees were more susceptible to disease, which further decreased yields. “In order to have the damage on the magnitude of 2004 and 2005, you’d have to wipe out the entire citrus crop,” Ganes said. 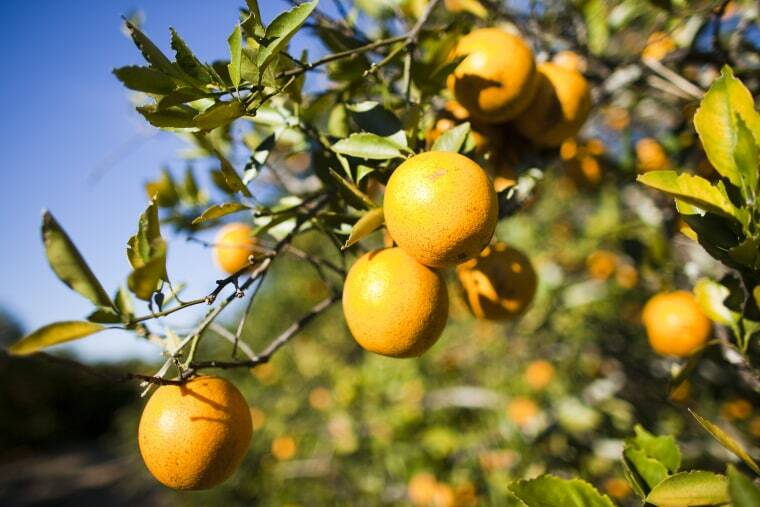 “At the end of the day, up to 50 percent of the citrus crop could be devastated." The silver lining is that Irma is coming before many citrus varieties are ready to harvest. The lighter weight of immature fruits gives them a better chance of hanging on to their branches in strong winds, but the size and ferocity of Irma still makes them vulnerable, and if the wind uproots the trees, the result is a complete loss. Long-term ramifications also concern Kilburg, particularly in regard to how Irma could shake up the crop insurance marketplace — a question that has implications that go beyond citrus groves.